RuinTen poured a dark copper/amber color (a color I most often associate with IPAs). It was very clear with streams of bubbles leading up to a slice of off-white head. As if there was any doubt the nose is all about hops. Pine needles, cat pee, cedar, honey biscuits, and fresh cut grass were all detectable in their own unique way. 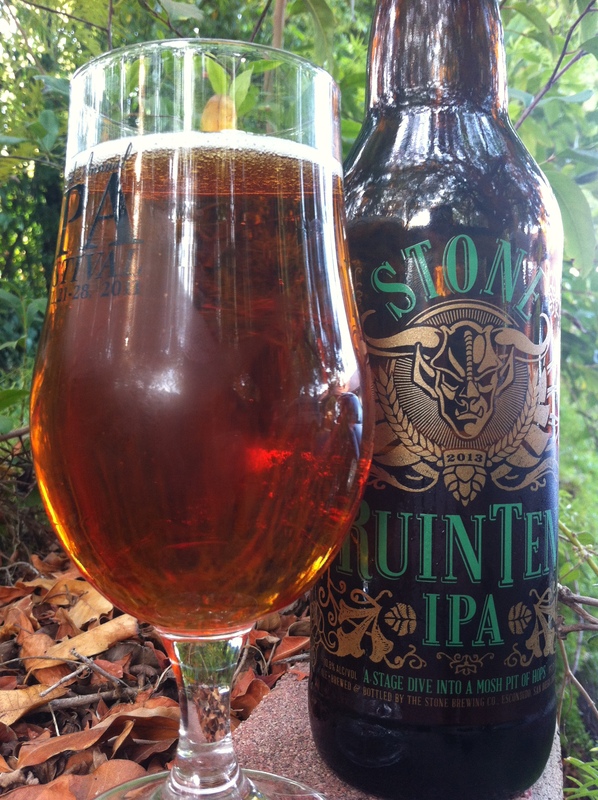 This beer is all about that signature Stone style, with the “C” hops (Cascade, Chinook, Centennial) at the forefront. There’s a thing about certain IPAs/DIPAs where the only way to explain the taste is by writing “HOPS” in all caps…this is one of those beers. Cedar soaked in pine sap is the first thing that is discernible in that initial hop blast. A touch of tobacco and honey biscuits gives your taste buds a slight reprieve in the middle of the beer. It finishes with a mild peppercorn like spice and a big alcohol heat. As it warms up some sweet citrus notes appear that mellow out the asserted flavors that came before. Mouthfeel is sticky icky icky! Hop resin practically leaks from the bottle and coats your mouth. It evaporates rather quickly, but the hop oils doesn’t really go away. That touch of heat rears its head, but it’s no match for the hop oils. 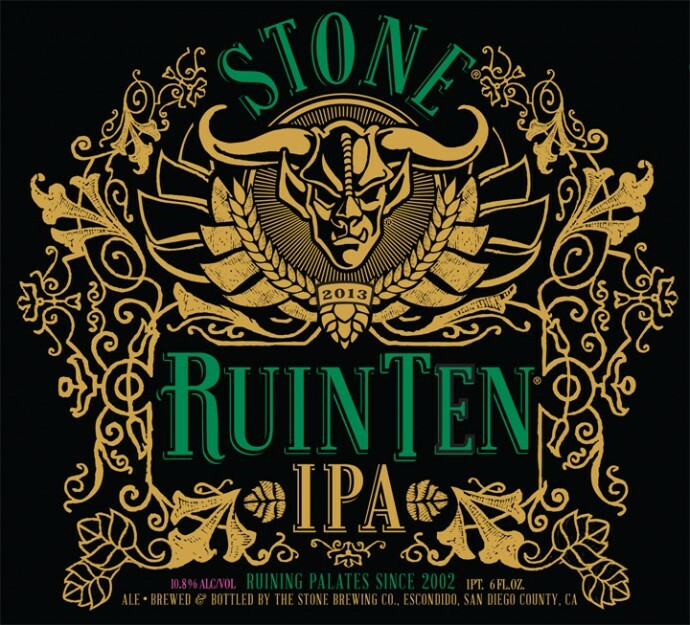 RuinTen is a hop bomb, just like almost every other Stone (D)IPA. However, it doesn’t seem nearly as balanced as I remember the Tenth Anniversary Ruination being. If you’re in the mood for a DIPA that will strip the enamel off your teeth then look no further than RuinTen IPA.